One of the major impacts on overall customer lifetime value (CLV) is the firm’s ability to retain customers. An increased loyalty rate can substantially increase the average lifetime period of the customer, resulting in a significant increase in customer lifetime value. However, it is unlikely that any cohort of customers will have a static retention rate. 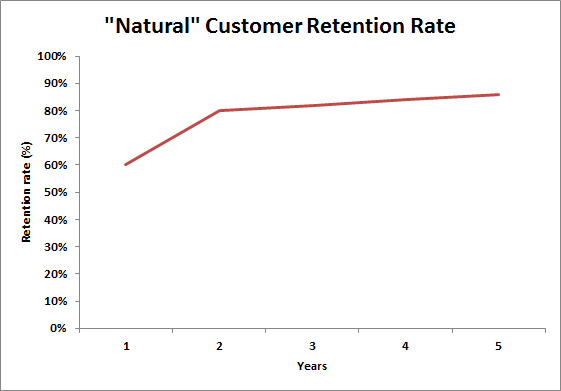 It is likely that retention will increase over time. You should note that the free template provided on this website to calculate customer lifetime value, allows you to modify the retention rate each year. Obviously, for most firms/brands there is a natural goal to increase retention rate – but this will happen automatically in most cohorts of customers. Let’s assume we have acquired 100 customers in a particular year. Upon their first/early experiences with the firm/brand, they will go through some “customer satisfaction” (post purchase) evaluation. As you probably know, this is aligned to their expectations prior to purchase. Let’s assume that 25% of these new 100 customers are relatively dissatisfied with their purchase, with the remaining 75% relatively satisfied with their purchase. You would probably guess that many of the 25% dissatisfied customers are unlikely to continue as customers into the second year – and you can probably also guess that a significant proportion of the 75% satisfied customers will remain loyal to the firm/brand. If we enter the second year, say with a 60% retention rate – with all of these retained customers being part of the original satisfied group – therefore we held 60/75 of these satisfied customers and we lost all 25 dissatisfied customers. Therefore, as we enter year three, we only have generally satisfied customers. While we had a 40% churn/loss rate in the first year – due to a proportion of new acquired customers being dissatisfied – they have left the firm/brand – and will not impact the retention rate of this customer cohort into year three. This will mean that we are likely to see a significant jump in retention rate for this customer cohort – perhaps up to 80%. This process likely to continue, with the quite satisfied customers continuing and the less satisfied customers being more likely to drop off. Over time, the firm/brand should be left with a small, but loyal and quite satisfied, customer base – where retention keeps increasing. 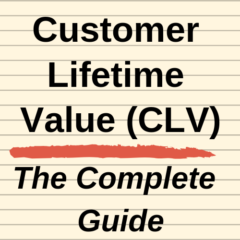 Previous Previous post: Customer lifetime value – does the average lifetime period make sense?